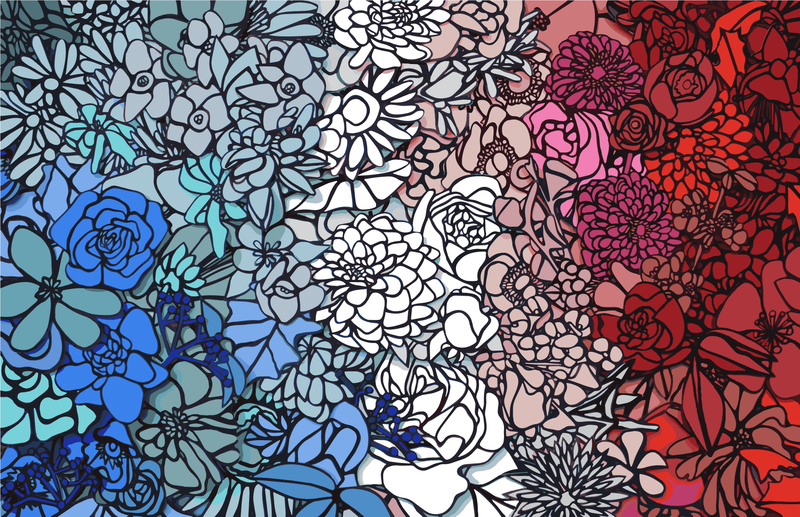 I’m so thrilled to share this beautiful red-white-and-blue illustrated floral print that we commissioned from Seattle-based artist Josephine Rice. 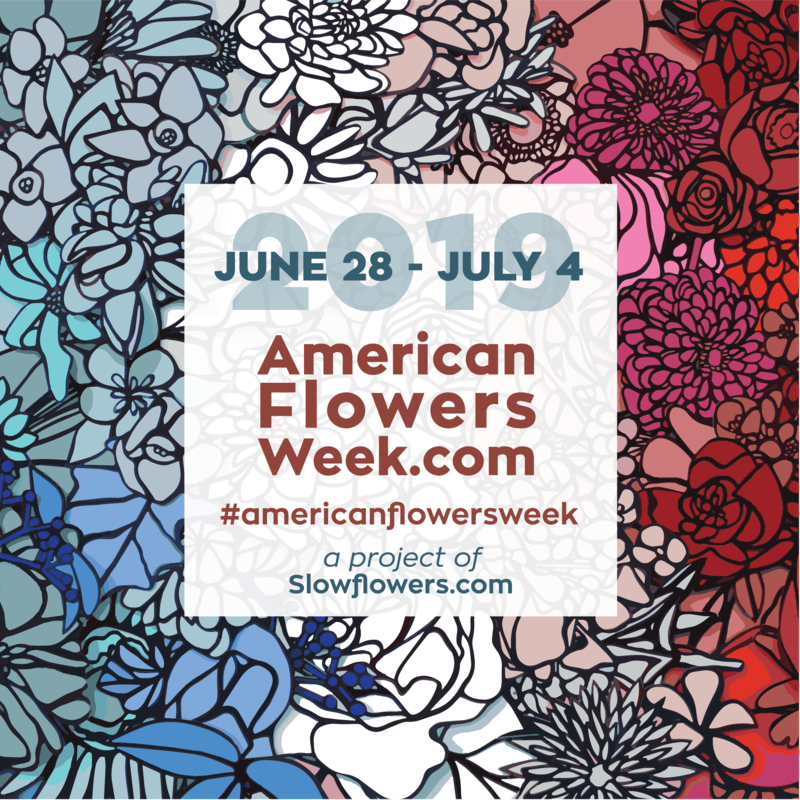 You can download our free graphics for your 2019 American Flowers Week Promotional use here. 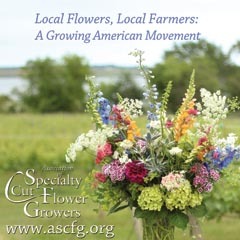 I’ve known Josie through the local floral community, including my floral designer friend Anne Bradfield of Floressence, for whom Josie has worked. But Josie’s real talent is illustration and printmaking. Anne gifted me a framed print by Josie, which I cherish. And the more I followed her Instagram feed, and watched how creatively she plays with palettes, patterns and depth, I couldn’t wait to see what Josie might do with a red-white-and-blue floral theme. 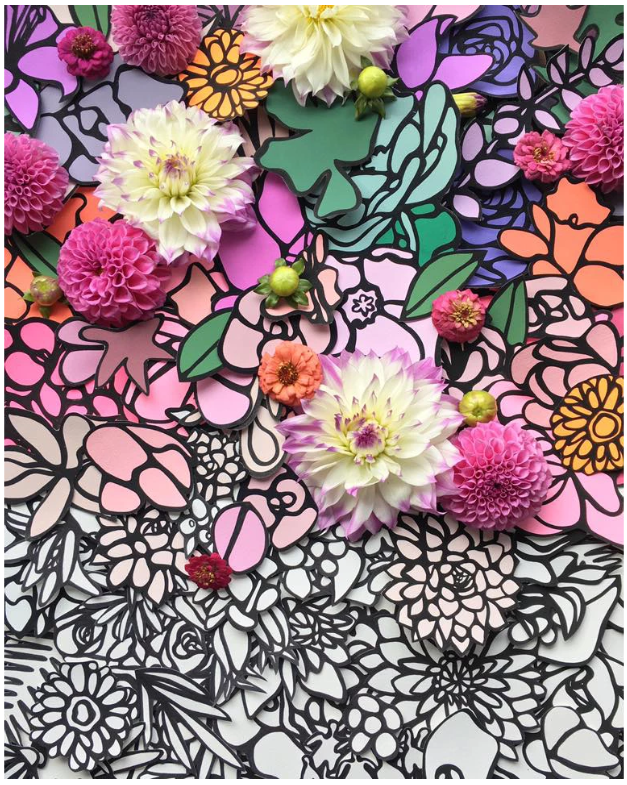 Ever since I first saw Josie’s graphic, playful, polychromatic, floral-patterned illustrations, I’ve been glued to her Instagram feed. Josephine Rice, our American Flowers Week artist, photographed recently on a trip to the Olympic Peninsula in Washington State. I just love how her stylized flowers, buds, vines, leaves, pods and petals add up to something so visually mesmerizing and pleasing to the eye. 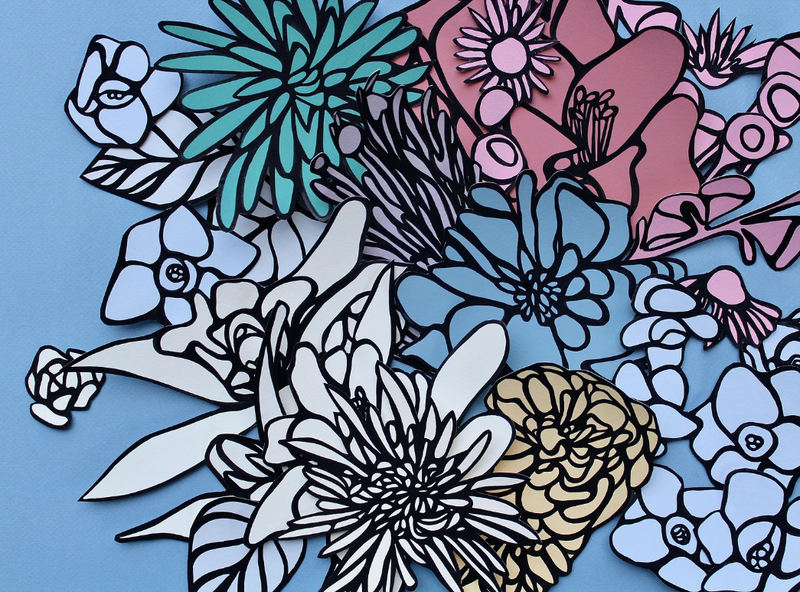 What she sees in a three-dimensional flower inspires her two-dimensional art. Her drawings are far from literal, but they convey the personality and attribute of each element beautifully. Together, the hundreds of small botanical shapes that appear in Josie’s compositions are bold, engaging — and very much dimensional. 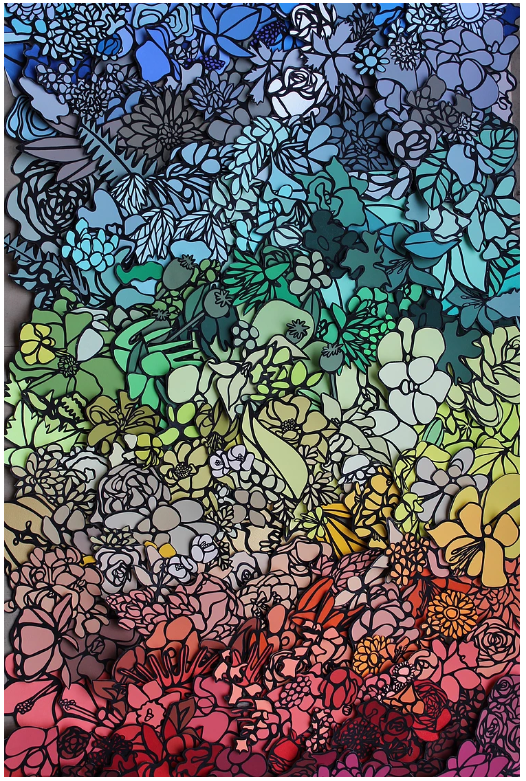 I’m fascinated with her color sensibility, her use of thin and thick black lines to define each shape, the patterns created by layering cutouts of plant parts, and then . . . the final expression in a print you can frame. 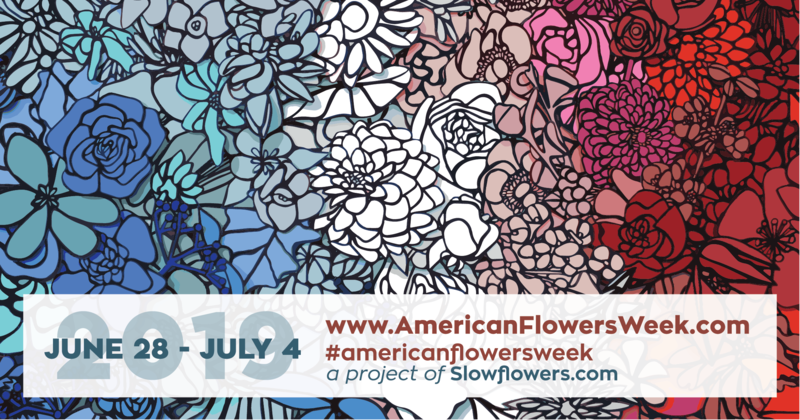 That’s why I wanted to commission Josie to create our 2019 American Flowers Week branding. I’m unveiling it here, reveling in the quirky red-white-and-blue palette that is so joyous and uplifting. Mind you, Josie’s take on red-white-and-blue is a modern twist on the conventional patriotic colors. In the botanical world, flowers themselves change color throughout a single season, so I thoroughly appreciate how our artist has reimagined traditional flag colors in a new, inventive way. I recently met Josie for an extended face-to-face interview and I’m sharing part of our conversation to introduce you to this ingenious artist. 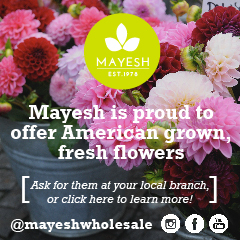 You can download your own badges and graphics to add to your social media as you begin planning and promoting American Flowers Week in your market. 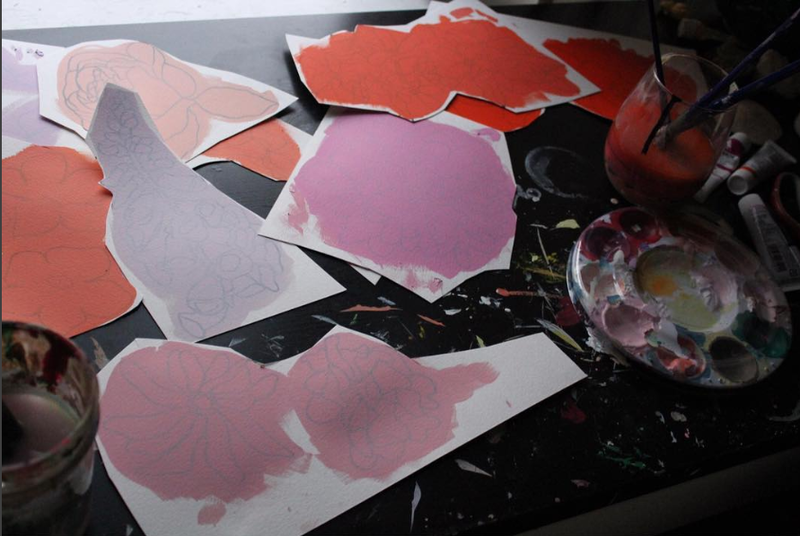 A glimpse into Josie’s art practice and process. Debra: Tell us about your early relationship with art. Josie (laughing): When I was a kid, my preschool teacher told my parents that I was gifted in art. I was drawing faces with all the facial features when I was very young — ones that are normally left out in children’s drawings. Debra: When did you start seeing yourself as an artist or wanting to pursue art in your life? Josie: I always wanted to paint and draw and be creative. In high school, I was determined to be a painter. I was very determined to have a “not normal” life. I did not want to sit behind a desk. I would do anything to not go down that road. This is one of Josie’s earlier works that that inspired our 2019 American Flowers Week design. Debra: Where did you go to school? Josie: I went to Milwaukee Institute of Art and Design, a small art school. I started in integrated studio arts, which was mixed media-fine arts. But really rapidly, I started getting panic attacks. Basically, I hated that I had to explain everything. Every week we had multiple critiques about, “why did you do this?” and “why did you do that?” I wanted to say: “I didn’t have reasons. I just drew it.” It was like I had to have a big story, a big political statement or some deep poetic thing, and I couldn’t explain myself that way. Debra: Isn’t that sad, that that’s what the teacher wanted from you? Josie: Yes, and I see now how it all turned out okay, but at the same time, I was feeling like maybe I shouldn’t be doing painting. Maybe I should get a degree in something that would help me get a job. Debra: What did you do? Josie: I changed to interior architecture and I graduated with a BFA in 2010. I really enjoyed it. I loved model making. I just wanted to use my hands. I loved using my hands. And yet, I also found that the craft had turned into AutoCAD and I would have literally lived my life behind a computer screen doing AutoCAD and drafting — and that made me just want to die. Debra: So how did you wrap up college? Josie: At thesis time, I wanted to do my thesis on a tree house. I wanted to build a tree house and I proposed this whole project to my teacher, and he said: “I really don’t think you should do that. I think it’s cool, but maybe you should focus on something that’s going to help you in the real world.” It was the stupidest mistake ever. I like what I did for my thesis instead, though. I designed a hostel that was inspired by my first big trip. I went to the Galapagos Islands. Debra: What did you do after college? Josie: I graduated feeling really disheartened that if I could even get a job, I was going to be doing AutoCAD. The economy was down. Jobs weren’t really happening for a lot of people and honestly, I think there are only two people from my major who are working in the field. I ended up working at a restaurant that was like my family in Wisconsin. Debra: Did you ever get back to tree houses? Josie: I went on a West Coast tour with my sister — we stopped in Seattle and Vancouver and Oregon — all along the coast. I’d always had a fantasy about coming out this way — it was just my hippie dream. After I was back in Wisconsin, and I remember this very vividly because I had just gotten dumped, I opened my tree house book. 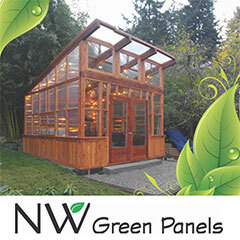 Seriously, the page dropped open and I read this: “Come to our tree house workshop in Issaquah, Washington.” I remember thinking: “I’m going.” I had not given up on tree houses yet. Josie: Yes. It was Pete Nelson’s Tree House Workshop at Tree House Point. In recent years, I think he is now focused on a television show on Animal Planet, so I got lucky because it was one of the last years he held workshops. After that, and after being around the mountains and the forest, which was amazing, I had to move to Washington. So I saved up; I had a boyfriend at the time and I told him, “I’m moving to Washington.” and he decided to come with me. 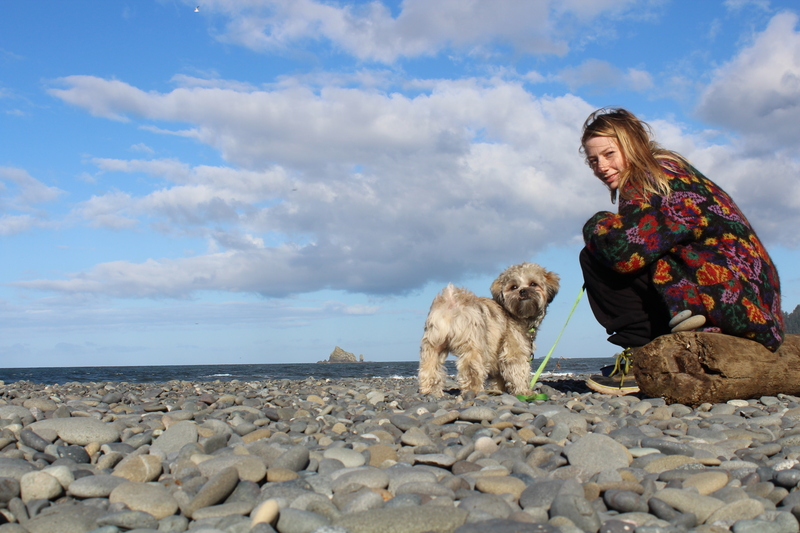 We drove across the country; we had no plan and started running out of money fast. Debra: What year was that? Note the intricate botanical detailing in one of Josie’s compositions. Debra: How did you support yourself? Josie: I remember going online and searching any place where I could display my art. I got lucky to connect with a place called Venue in Seattle, which showed my art. I was new to making art and it was nothing like what I make now. But even then, I was making flowers. I always did flowers. I somehow can’t draw anything else. I just have a very specific style and I can only do it that way. I love this image of some of Josie’s favorite flowers and the artwork they inspired. Debra: What is your preferred medium? Josie. Gouache. I had always liked gouache and that’s what I still work in now. Debra: Describe gouache to me. Josie: I would call it a thick acrylic. Basically, instead of getting those watermarks, your goal is to make a flat, saturated, solid color — and I was just drawn to that. Debra: That matte effect you create is so compelling. I could just stare at it all day. Debra: I actually thought you used colored paper and cut it out — but you’re painting on the paper. Josie: At one point, I was cutting out paper. Yeah, that was actually a short period of time — another heartbreak and I had nothing to do. So I was in my apartment, cutting up solid colors of paper and I realized I had these really cool designs, but I couldn’t tape up pieces of paper to the wall. That’s not going to work. I was so concerned with, well, “how am I going to hang this on a wall?” So I started painting on paper. Debra: It sounds like the difference between the craft and the art, you now? Debra: That’s really good advice for anybody, really. Josie: There’s the level of trying to make it your living, and then also letting go a bit. Debra: Right, and finding your voice in all of that. Josie: Yes, and don’t think it’s all over the second you start. I have no idea what my art is going to look like in five years. I can’t wait to see. Debra: So you started having more fun with your art, but how did you get it out into the world? Josie: By then, I think it was 2013, I had moved to Crate & Barrel, where I was a furniture saleswoman. But I was a horrible salesperson. I was literally selling couches and didn’t even own a couch! I had an empty apartment with a futon in it. Debra: You were the anti-salesperson. Josie: I was just so miserable. Kickstarter had become a new thing, and I had poked around on the site. I found myself thinking, “who are these people asking for money to work on their art?” There was one in particular that I saw, who, in my opinion, was not anything very good. And this person raised a bunch of money. I was just flabbergasted and I thought, “I can do that.” So I put up a Kickstarter campaign. Somehow it actually worked and I raised the money. Debra: Wow! What was your campaign? Josie: I said I wanted to raise $3,000 to focus on art for a summer. To have time to work on my art and put on an art show. It was amazing. I felt so loved by the people who supported me. It really changed my mindset that people want artists; people want you to pursue your craft. It was like Christmas morning when I raised the money. Debra: Where was your show? Josie: It was at Venue. I rented out the place and invited people. And we had a night of my art. It was sweet. One of Josie’s local murals, showing the beautiful connections between her large-scale and small-scale artwork. Josie: I had quit Crate & Barrel, so I got hired as a waitress at a restaurant where I worked while still making my art. During this time, I started making murals. Being a mural artist has always been a fantasy of mine, but I realized there was no way I was ever going to get a mural job unless I had a portfolio of murals. So, I put out an ad on Craigslist, and offered: “I will do a mural for free for you. 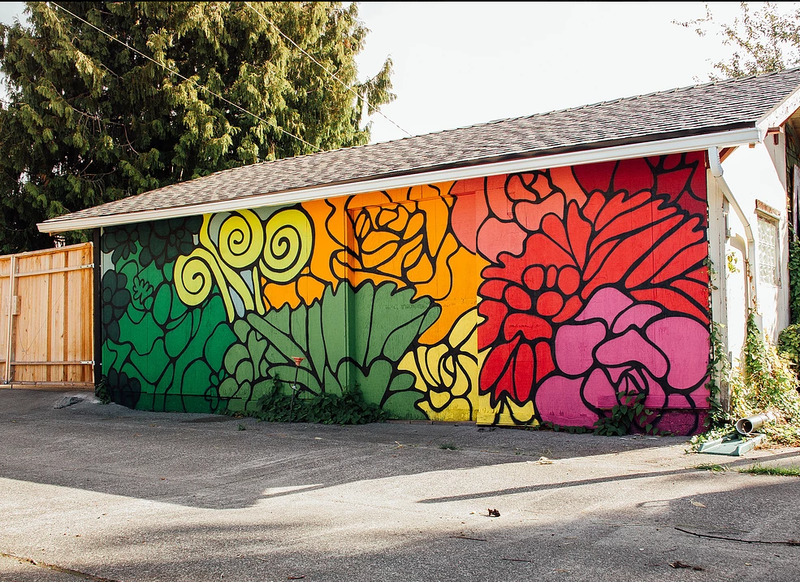 I will pay for the mural if you have a wall.” I got lucky and a few people wanted me to do a mural. They let me do insane rainbow stuff. Debra: Your murals were on garage doors and sides of buildings, right? Josie: Yes, and they were so fun. I met the nicest people who were looking in the artist section on Craigslist, willing to let me paint their building. Debra: What came out of the mural work? Josie: I got this idea, “I love flowers so much; why don’t I work in flowers?” That just clicked one day and because I also love travel, I thought, “if I’m going to go to a workshop, I’m going to travel at the same time.” I ended up taking a two-week workshop on The Business of Flowers at Judith Blacklock’s Flower School in Knightsbridge, London. That was three years ago and when I came back, I just cold-called everybody in Seattle looking for a floral job. Debra: Where did you land? 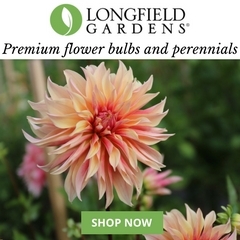 Josie: I went to work for Anne Bradfield of Floressence in Seattle. It worked out wonderfully to have Anne take me under her wing. She was so patient with me. At least I knew art and I knew design and I knew what looked good and what doesn’t look good. Debra: How did your art change because of working with flowers? 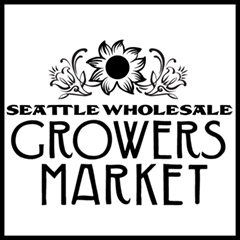 Josie: Before I even went to the London workshop, I would go to the public hours at the Seattle Wholesale Growers Market. I was drawing flowers and I needed inspiration, so I would go there and snap a bunch of pictures and buy just one bundle of something. It was so amazing. I remember being there one day and taking home Icelandic poppies, which were, to me, the most special thing I’d ever seen. I also ended up working part-time at the Market, while also working for Floressence and making art. I was getting so much inspiration at the Market. I was seeing things I’d never seen before. 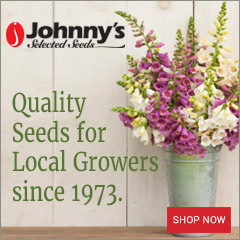 You don’t see those flowers on the street. 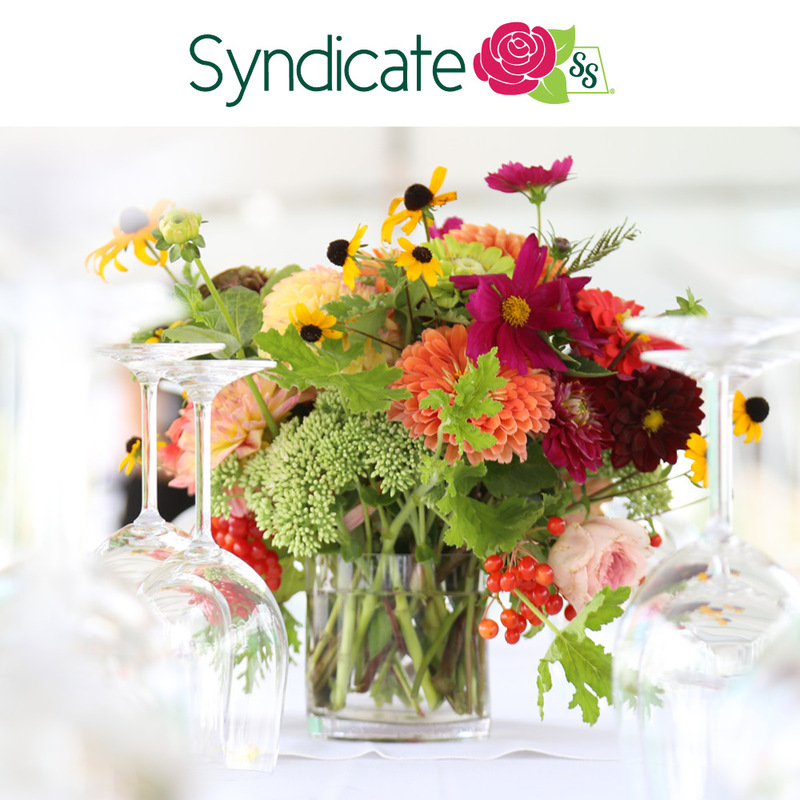 I began to focus on different palettes or whatever is in season at the Market. Debra: Where are you now with your art? Josie: The work I am creating happens when I forget about “how am I going to sell this?” and instead focus on “I just like drawing. 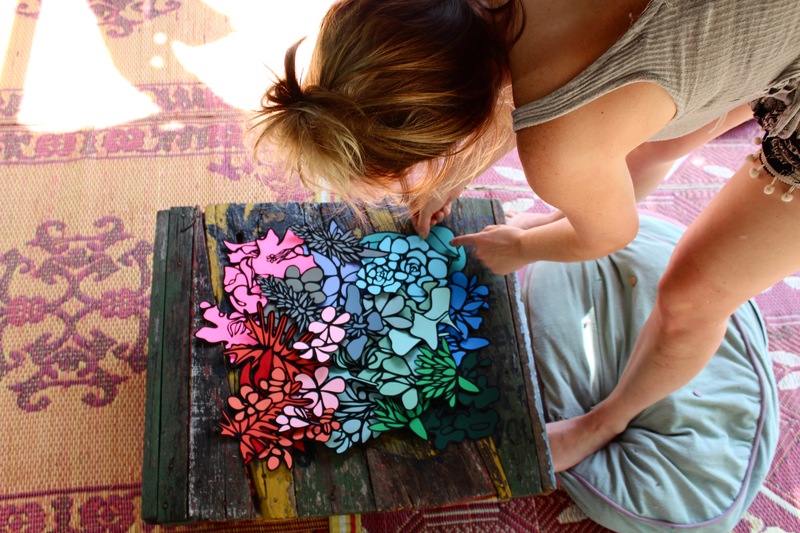 I just like painting on paper and making paper cutouts. I make little pieces of paper and over time I have hundreds of them. Then I layer them together. It looks beautiful and who cares if I sell it or not? Maybe all I care about is that it looks cool to share a glimmer of beauty on the Internet. Debra: In a way, there’s a thread between the murals I saw on your web site and the prints you’re doing now. Josie: Oh yeah. It’s all about the line. That’s what I have going for me. My line. Everything starts with the Sharpie. I love Sharpie. I start by sketching flowers with a black Sharpie, which often looks like a doodle. Then I paint the whole page. Then, my favorite part is adding tiny details of the black line and cutting out the shapes. Debra: One of the first times I met you, you mentioned wanting to exhibit at SURTEX in New York. I looked it up: SURTEX is a big trade show for artists to sell original art and design. 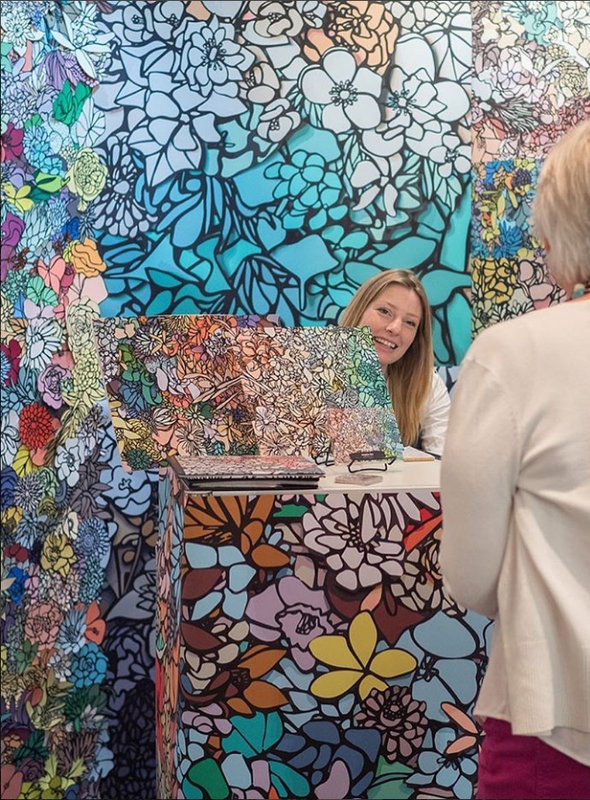 That’s where you exhibit your work to agents, licensors, manufacturers and retailers who are looking for art to make wall coverings, patterns, decorative accessories, bed linens, stationery, giftware, apparel and more. Josie: Yes and I’d been thinking about going for two years. It seemed very daunting but I knew I had to do it. It was this past May and I was in the First-Timer’s Area. My mom went with me and it’s so awesome to have parents who want me to pursue my dreams. Debra: How did SURTEX go for you? Josie: I felt confident that yes, I have something good here. It felt good to know I have a style and somehow that style has developed. In fact, I was commissioned to make a design for a client, which will be out soon. SURTEX showed me that yes, you can sell your art to businesses. But could also be your own business. Debra: What else did you learn about yourself by taking that huge leap? Josie: I used to think it was really wrong to take photos of a flower and then draw it later. Then I realized that process actually goes with the way I work, because my work is flat and I’ve simplified what I’m drawing. The paper cutouts give my work a 3D look. Now I’m exploring starting my own line, maybe a line of journals. Debra: Josie, I’m so glad you made a piece for American Flowers Week. Josie: Thank you so much!